What sessions to send: Which application(s) and what sessions for those applications. 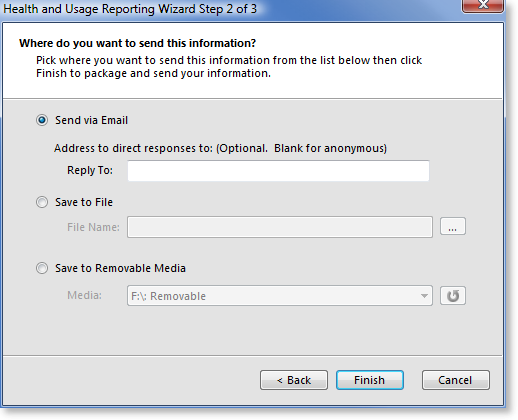 How to send them: To a Loupe Server, via email, file, or removable media. Transmission options: For the Server, the server connection information. For email, what email address to send to and what email the package should appear to come from. For file the full file name and path to use. Most of these options can (and should) be specified in your Loupe configuration - either in your App.Config file or provided during Log Initialization. This allows the wizard to operate in the most streamlined fashion possible for end users. For more information on the configuration options, see Developer's Reference - Packager Configuration. From Code: You can directly work with the PackagerDialog class to cause it to display from within your application. From the Live Viewer: If a user clicks Save from within the Live Viewer the Packager Dialog will be displayed. From a Hot Key: By default the Loupe Agent will display the Packager Dialog if the user presses Ctrl-Alt-F4. You can adjust the hot key (including disabling it) in the Packager Configuration. 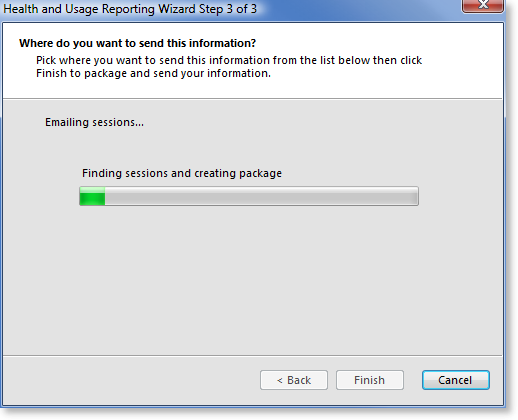 Sessions are marked as having been sent upon the successful completion of the Packager wizard. 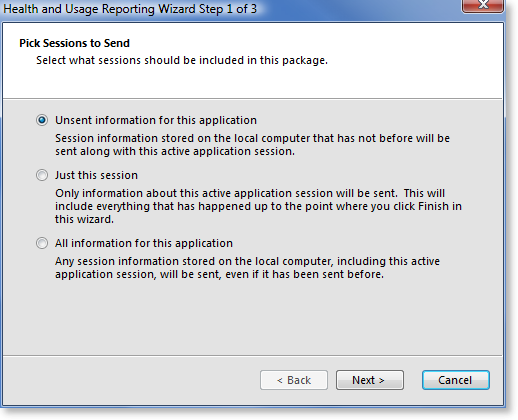 If the wizard is canceled or doesn't send the sessions successfully they will not be marked sent. The user selects where the package should be written - to an email, to a fully specified file name and path, or to removable media. Individual options can be configured and disabled through the application configuration file. If the configuration file specifies all of the necessary options then the user will not be presented with this screen. If a Server connection (used for Loupe Server) is configured, allowed, and accessible then it will be automatically used and the user will not be prompted with this screen. If you leave the email option enabled, you should either specify email server information in your application configuration file or have high confidence that the .NET email server information will be specified in the machine.config file on each computer that will run the packager. Otherwise, the packager will be unable to send email. It's also recommended that the destination email address be specified. For more information see Developer's Reference - Email Configuration. Once the user has selected the transmission method and clicks Finish they will see a progress bar and status messages while all of the sessions are gathered, written to a package, stored in the final location, and sessions are marked as read. Because the stand-alone Packager utility (Gibraltar.Package.exe) is a simple wrapper for the Packager Dialog, it looks essentially the same as the Packager Dialog however there are some minor differences on the first screen because it can't package up the Active session.